What can you make for dinner in fifteen? Pasta with homemade tomato sauce, that's what! Put on your running shoes and jog over to the pantry. Most of the stuff you need is in there. Grab it and GO! Jog back to the stove. With back straight, inhale and bend your knees. Now, open the drawer or cabinet and pick out two pots... Remember to breathe through your nose. Fill your deep, pasta-cooking pot with water while running in place. Put covered pot on high heat. While it is getting ready to boil, take out the following ingredients and prep everything. 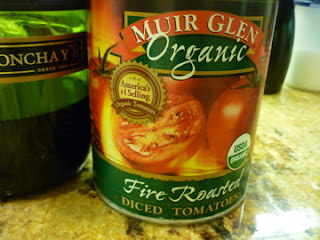 Open a large can of diced, fire-roasted tomatoes. 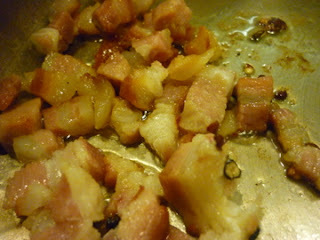 Chop up half of a thick slice of pancetta. 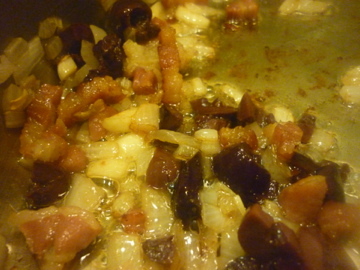 Dice these three things and set aside: a small onion, two cloves of garlic and a handful of pitted kalamata olives. Keep your back straight as you chop the onion and garlic. And breathe! Tear up a few leaves of fresh herbs, whatever you've got, whatever you like... basil, rosemary, oregano, thyme. Throw a pound of any kind of pasta, besides angel hair, (too skinny,) into the boiling, salted water. 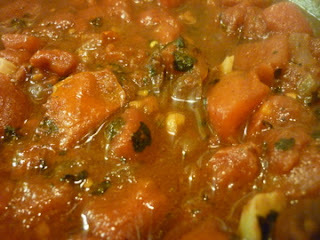 Stir it well before you get distracted making the sauce. Now, standing with legs at shoulder width and back straight, start with a large flat-bottom saute pan. Drizzle in one fourth cup of olive oil. When it gets hot, throw in the pancetta, a few red pepper flakes and the onion. 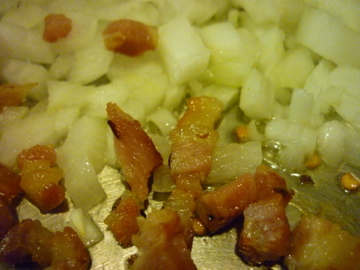 Cook it until the onion begins to brown. Put in the garlic, don't let it burn. Stir ten strokes in a circular motion, using your entire arm. Add the chopped olives. Stir ten strokes with the other arm. Deglaze the pan with about a half cup of dry white wine. Pour in the can of tomatoes. Toss in your herbs and give it a stir. Add salt and pepper, then taste. If the sauce is too tomato-y tasting, you can correct it with a pinch of sugar or a dash of worchestershire sauce... or both. Simmer for another five minutes or so. In the meantime, using the other part of your brain or the assistance of a nearby family member, remember to check the pasta. Don't let it get to the mushy stage. Remove it while it is still a little chewy and drain, reserving about a cup of pasta water... just in case. Dump the whole thing into the sauce, mixing it together. 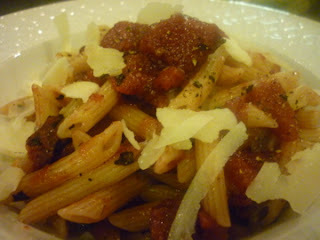 The pasta will continue to cook. Taste for seasoning. If you need to loosen it up, add a little of that wonderful, starchy pasta water. Jog in place while the flavors in the pot get to know one another. 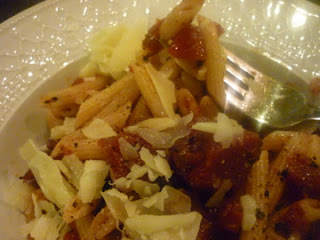 Throw on some parmesan cheese, drizzle a little olive oil over and serve. Whew, that was fast... You feel good and you look good!